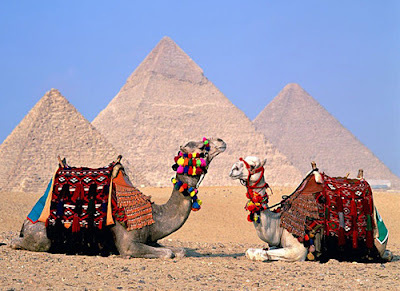 You may count yourself lucky, if you can take a photo of Giza, the sphinx and a camel without paying for the priviledge. It is a well-known fact that tourists equal bakshees. I’m quite willing to give a tip, but not for a photo of a camel and a pyramid. Friendly, but persisting guides will show you hidden hieroglyphs, which you would have found anyway. They will tell you from which where to snap the best photo and how to mount a camel. Giving tips are an essential part of a trip to the pyramids of Giza, there is nothing wrong in with this. I’m perfectly willing to tip, but only when someone has helped me in a special way. I know wages in Egypt are low and a tip is an essential extra, but it should not be an obligation. The pyramids are huge, imposing and awe-inspiring, yet I was slightly disappointed as I had seen so many books and photos all showing these pyramids. What these books did not show was that the pyramids are on the outskirts of Cairo, and not in the middle of the desert. Pyramids are built of limestone blocks. They consist of a number of burial chambers. One of them is for the dead pharaoh and others for the funeral goods. Cheops, the largest of the three pyramids is open to visitors, but there is not much to see besides other tourists and a vast empty chamber. The Great Pyramid took 30 years to build. In about 2,550 B.C., King Khufu, the second pharaoh of the fourth dynasty, commissioned the building. 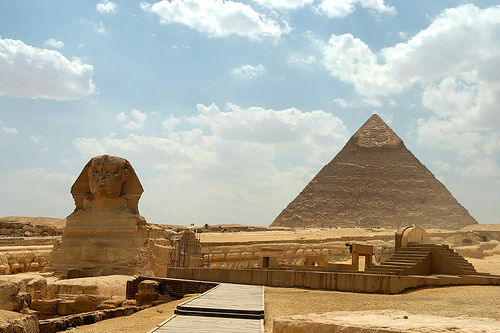 Khufu’s son, Khafre, commissioned the building of his own pyramid complex which includes the sphinx. Menkaure, Khafre's son, built the third and smallest of the three pyramids. The Giza complex is a family tomb. Over two million blocks of stone each weighing 2.5 tons were used. It is still a mystery how the pyramid builders moved these massive stone blocks. The general belief is sloping ramps, built of mud, stone, and wood were used as transportation causeways. The building blocks were hauled up by means of ropes made of papyrus twine. The sloping walls of the pyramids look a bit rough. Due to natural erosion and with a bit of human help, the outer casing stones have disappeared from all three. The precious white limestone was good building material and used in the construction of buildings in Cairo. The Sphinx has the body of a lion and the head of a pharaoh and believed to be the head of Pharao Khafre. Carved from the soft limestone of Giza, the sphinx has been renovated because over the years because entire pieces dropped off. The sphinx is truly impressive: 57 metres long and 6 metres wide. If you are a photographer, it is best to come in the then the sun shines on the sphynx's head. A camel is easy to spot, but difficult to photograph unless you are willing to pay for the privilege. Thanks for this view of a land where I will probably never get to visit.